Every business that deals with moving products from one place to another has to deal with challenges in shipping and logistics. Startups are often the most vulnerable to complications in this part of their business, which can ultimately drain resources and upset customers. "Supply chain disruptions lead to drastic increases in costs and losses of shareholder value, with examples of companies going bankrupt as a consequence," says Volodymr Babich, a professor of operations and information management at Georgetown University's McDonough School of Business. The most resourceful businesses thrive by coming up with creative shipping solutions -- whether it's to cut costs, simplify processes for vendors or improve the customer experience. 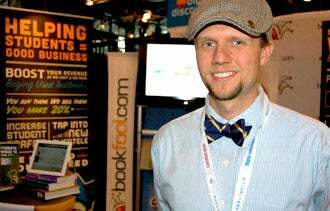 BookFool Founder Kristopher Lange exhibiting at the BookExpo America 2012 trade show. When Kristopher Lange, a junior at Ole Miss and a self-confessed "bibliomaniac," told his wife in 2003 that he wanted to buy a bunch of books at the university's library book sale and resell them online, she said, "Just keep it to one room." One room of their house, that is. Today, Lange's book buying takes the form of a successful resale business called BookFool. But with success came unique shipping problems that threatened to cripple the company. BookFool relies on dozens of bookstores around the country to send merchandise to its warehouse in Nashville, Tenn., for resale online. Lange, a CPA with an advanced degree in accounting, worked with a friend to create point-of-purchase software that assesses the fair market value of used books in real time. Starting this year, BookFool's 80 bookstore affiliates are now able to see what price to pay for used books, which they in turn sell to BookFool for a 20-percent commission plus the price of the books. The problem then became how to handle a high volume of inbound shipments and offer a simple, cost-effective way for its affiliates to send in books. But then Lange discovered through a FedEx account executive that he could use FedEx's Ground Package Returns Program to handle book shipments, although they aren't technically product returns. The United Postal Service runs a similar program called UPS Returns Pack and Collect. BookFool now supplies its affiliates with preprinted return shipping labels, which have a bar code that allows for shipment tracking and payment processing. Affiliates box up their books and FedEx picks up the boxes for delivery to BookFool's warehouse, a seamless process for the bookstore owners. "We want to be the Zappos of textbook wholesaling," Lange says. His company may be on its way. Despite treating 2012 as a "conversion year" in which they began to implement the affiliate program, they are on track to make $2.2 million in revenue this year, down slightly from $2.5 million in 2011. Fifty percent of BookFool's inventory is textbooks -- fitting for a company that got its start on a college campus. Contempo Space Co-founder David Einhorn in the showroom at the company's production facility. 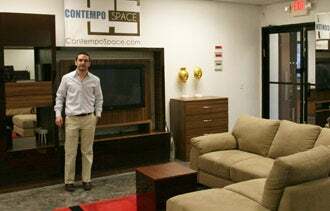 For Passaic, N.J.-based custom furniture company Contempo Space, the challenge lies not in receiving inventory but in the expense of getting it to customers. The made-to-order furniture is delivered to customers as far away as California and Florida. "We have our own crews and drivers that do all of the deliveries. We don't outsource any of it," says David Einhorn, who co-founded the company in 2000. And when you factor in gas, tolls, driver salaries and wear and tear on the trucks, the cost of driving back an empty truck after long-haul deliveries is considerable. To make its deliveries more productive and profitable, the company began backhauling: filling its trucks with deliveries for other furniture companies on return trips. Now when Contempo's trucks deliver furniture more than 200 miles from New Jersey, the team looks through its rolodexes for partners who can fill the trucks on the way back. By contracting out its trucks and drivers to other companies, Contempo Space has been able to increase profits considerably, Einhorn says. Revenue for 2010, the year the company began backhauling, was approximately $1 million. It has been doubling each year since and is set to break $4 million for 2012. Photograph-to-canvas printing company CanvasPop can get its products to customers without a hitch, says co-founder Adrian Salamunovic, but its products are being dragged down "by a mediocre package experience." He realized the problem when he had to ship some goods to himself from his own company earlier this year. When the packages arrived, Salamunovic found he had to hack through a "cocoon of protection" to get to each delicate canvas, and the packages themselves were unremarkable, "just Plain Jane and kind of a pain" to open. This experience of "eating his own dog food," as he puts it, was humbling. What emerged from this experience was a plan to improve both the practical matter of opening the packages and the packages' aesthetics. Some ideas he jotted down were a string that you could pull to open the box and an eco-friendly ink stamp to remind people to recycle the cardboard. By Thanksgiving, Salamunovic says, the packages will be easier to open, with attractive branding and some special inserts, such as gift cards, in a single envelope "that will be very fun to find."